SFP, SFP+, QSFP, XFP transceiver modules are hot-swappable I/O devices, which are the key components in today’s transmission network. These devices are popular in data center, campus, metropolitan area access networks, and storage area networks. Therefore, knowing how to install or remove a transceiver module is very essential for networking administrators. The SFP modules are integrated fiber optic transceivers that provide high speed serial links from a port or slot to the network. The SFP+ transceiver is an enhancement over the SFP optics developed for 1 Gbps Ethernet and 1 Gbps, 2 Gbps, and 4 Gbps Fibre Channel. The SFP+ modules extend the data rate up to 11.10 Gbps. Various latching mechanisms can be utilized on the SFP and SFP+ modules. There are three types of latching devices to secure a transceiver in a port socket: mylar/pull tab latch, bale-clasp latch and actuator button latch. QSFP is a compact, hot-pluggable transceiver used for data communications. The QSFP specification supports Ethernet, Fibre Channel, InfiniBand and SONET/SDH standards with different data rate options. QSFP transceivers support the network link over singlemode or multimode fiber patch cable. QSFP modules are commonly available in several different types: 4x1G QSFP, 4x10G QSFP+, 4x28G QSFP28. 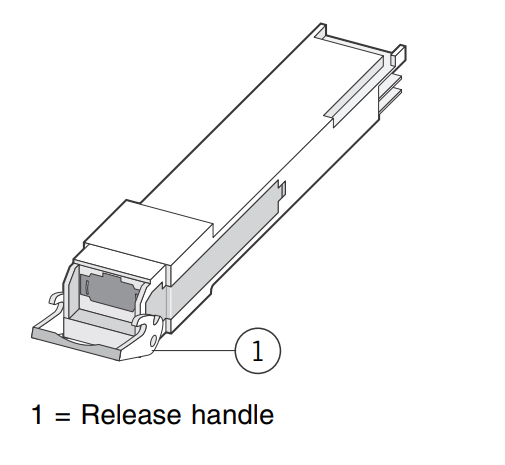 The QSFP uses the release handle latching mechanism as shown in the following figures. XFP modules are the standardized form factors for serial 10 Gb/s fiber optic transceivers. It is protocol-independent and fully compliant to the following standards: 10G Ethernet, 10G Fibre Channel, SONET OC-192, SDH STM-64 and OTN G.709, supporting bit rate from 9.95G through 11.3G. XFP transceivers are used in datacom and telecom optical links and offer a smaller footprint and lower power consumption than other 10 Gb/s transponders. 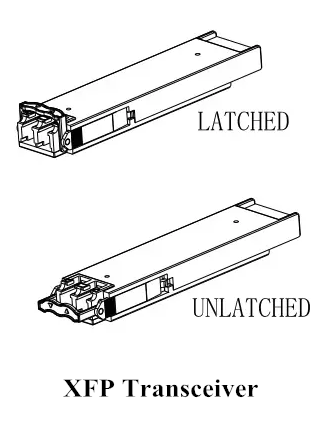 The XFP module uses the bale clasp latching mechanism as shown in the following figures. To preventing the cables, connectors, and the optical interfaces from damage. We must disconnect all cables before installing or removing a transceiver module. Please be aware that the regular installation and removal of a transceiver module can shorten its useful life. Thus, transceivers should not be removed or inserted more often than is required. Transceiver modules are sensitive to static, so always ensure that you use an ESD wrist strap or comparable grounding device during both installation and removal. Do not remove the dust plug from the transceiver slot if you are not installing the transceiver at this time. Similarly, we must use the dust plug to protect the optical bore if we don’t use the transceivers. The SFP, SFP+, QSFP, XFPmodules are referred to as pluggable port modules (PPMs). Step 1: Attach your ESD preventive wrist strap to your wrist as well as to the ESD ground connector. A metal surface on your chassis is also acceptable. Step 2: Remove the PPM from its packaging. Step 3: Check the label to verify that the PPM is the correct type for your network. Step 4: Locate the send (TX) and receive (RX) markings. These will allow you to identify the top of the SFP transceiver module. Step 5: Align the PPM in front of the module’s transceiver socket opening and carefully slide the transceiver into the socket until the transceiver makes contact with the socket electrical connector. Step 6: Insert the PPM into the socket until you feel the connector latch into place. Ensure that you press the PPM firmly into the slot using your thumb. Step 7: Verify the transceiver module installation. Attempt to remove the module without releasing the latch, if it cannot be removed then it is correctly seated. If it can be removed reinsert the module and press harder with your thumb, until you can verify that it is correctly seated. Step 8: You can now remove the dust plugs from the network interface cable. You should save the dust plugs for future use. a. Always keep the protective dust plugs on the unplugged fiber-optic cable connectors and the transceiver optical bores until you are ready to make a connection. b. Always inspect and clean the LC connector end-faces just before you make any connections. Step 9: Inspect and clean the fibre-optic end-faces on the LC connector. Step 10: You can now remove the dust plugs from the PPM’s optical bores. As soon as this has been completed you must attach the network interface cable to the module. If the LED turns green, the SFP transceiver module, the target device has established a link with PPM. If the LED is off, please ensure that the target device is powered on before troubleshooting. There might be a cable problem, or there might be a problem with the adapter installed in the target device. If the LED will turn amber for approximately 30 seconds prior to turning green. Step 12: Reconfigure and reboot the target device if required. Step 1: Attach an ESD-preventive wrist strap to your wrist and to the ESD ground connector or a bare metal surface on your chassis. 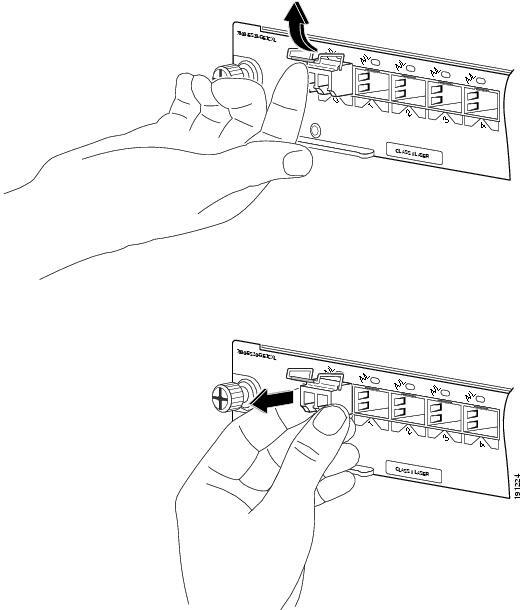 Step 2: Disconnect the network fiber-optic cable or network copper cable from the PPM connector. 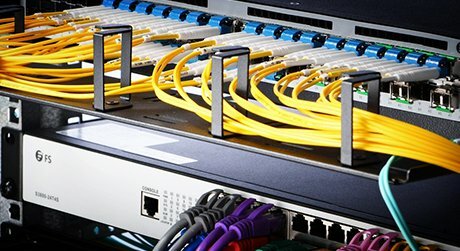 For optical transceivers, immediately reinstall the dust plugs in the SFP transceiver optical bores and the fiber-optic cable LC connectors. Step 3: Release and remove the PPM from the socket connector. a. If the transceiver has a mylar/pull tab latch, pull the tab gently in a slightly downward direction until the transceiver disengages from the socket connector, and then pull the transceiver straight out. Do not twist or pull the mylar tab because you could detach it from the transceiver. b. If the transceiver has a bale-clasp latch, pull the bale-clasp out and down to eject the transceiver from the socket connector. 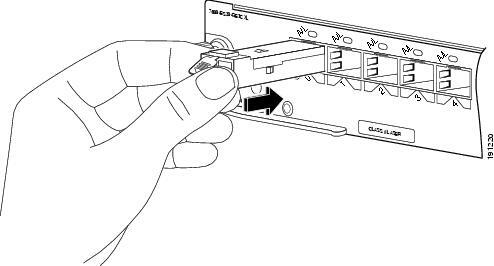 If the bale-clasp latch is obstructed and you cannot use your index finger to open it, use a small flat-blade screwdriver or another long narrow instrument to open the bale-clasp latch. Grasp the transceiver between your thumb and index finger, and carefully remove it from the socket. 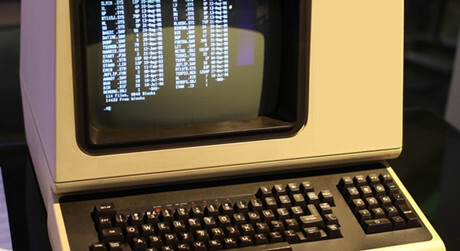 c. If the transceiver has an actuator button latch, gently press the actuator button on the front of the SFP transceiver until it clicks and the latch mechanism releases the transceiver from the socket connector. Grasp the actuator button between your thumb and index finger, and carefully pull the transceiver straight from the module slot. Step 4: Place the removed transceiver in an antistatic bag or other protective environment. As SFP, SFP+, QSFP, XFP transceiver modules are widely deployed, a good practice and correct installation are very important for network system, not only to protect the transceiver modules and device from damage, but also to ensure a stable performance for system. With the complete installation and removal guidance, you do need not to ask an engineer for help every time, even for some minor faults. 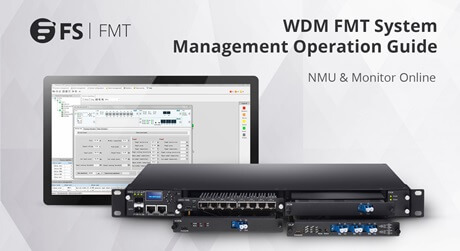 How to View the DDM Information of Optical Transceiver via SNMP?